Ellen aims to start a new Drake meme. 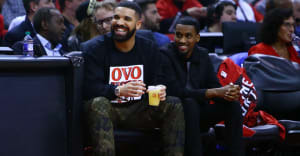 Drake continued his post-VIEWS publicity blitz this week with a stop by The Ellen DeGeneres Show. The star discussed the grueling aspects of hosting and performing on Saturday Night Live and the nature of his friendship with Rihanna. He also indulged in a game of "Never Have I Ever" with Jared Leto. DeGeneres also drafted someone to leap out and terrify Drake mid-interview. She then posted a photo of the surprise on Instagram, along with a hashtag, #MakeADrake. "Make a meme with this picture of Drake and post it with that hashtag," DeGeneres wrote. "If I show it on my show, I’ll send you some Ellen underwear!"